BIOS (BIOS) is a set of built-in computer programs that are designed to perform computer startup, configure their devices and loading the operating system. Like any software the BIOS can be configured. Restart the computer to enter the BIOS, and when you see the first screen press the Delete key. Other options are possible keys on different motherboards, usually on the splash screen will be shown message like Press Del to enter setup. If you specify another key, for example F2, press it to enter the BIOS. Navigate to the Boot sector. 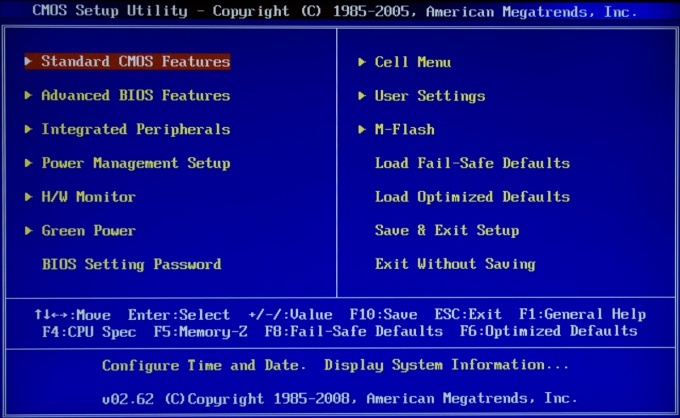 The management teams of the BIOS is performed using the cursor and Enter key. Find the setting Boot device - it is responsible for the sequence of boot devices. Highlight the desired option using the arrows and activate it by pressing Enter. Select the primary boot hard drive, to do this, select First Boot Device and press Enter, select HDD, and press Enter. Go to Power to set the BIOS settings for the cooler and CPU. Turn on the control system of the cooler and CPU. To do this, select option CPU Q-Fan Control set to Enabled, the option CPU Fan Profile select Optimal. Remove boot splash logo when turning on the computer to speed up system boot. To do this, navigate to the Boot sector, select Boot Settings Cohfiguration, look for Full Screen Logo, set the value of this parameter is Disabled. Go to Standard CMOS Setup to set the date and time of the system and the parameters of the hard drive of the computer. In the Integrated Peripherals section you can set the interface configuration and additional system functions. For installation options, energy and power refer to Power Management Setup. The function of binding to the cards the computer can be set to PnP/PCI Configurations. To determine the indications of the system sensors (CPU temperature, fan speed), refer to Hardware Monitor. To restore the BIOS default settings, select Load Setup Defaults. Commands in different versions of the BIOS may vary slightly from that described above.